Professor Kian Tan graduated with a B.S. in chemistry with a specialization in biochemistry from the University of Virginia in 1999. At UVa, Kian performed research in the group of Professor Dean Harman working on the development of an osmium-mediated asymmetric Diels-Alder reactions and the synthesis of epibatidine derivatives as analgesics. 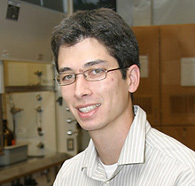 Subsequently, Kian worked jointly with Professors Robert Bergman and Jonathan Ellman at the University of California Berkeley on novel metal-mediated C-H activation reactions. He obtained his Ph. D. from UC-Berkeley in 2004. Working as a postdoctoral researcher in Professor Eric Jacobsen’s group at Harvard University, Kian focused on bifunctional urea catalysts for the enantioselective allylation of hydrazones. In 2006, Kian began as an Assistant Professor at Boston College where he enjoys teaching organic chemistry and guiding a research program focused on the new catalysts for the transformation of organic molecules.